The SPYPOINT Link-EVO-V Cellular Trail Camera can transmit data using 4g, pictures are easier to save, and you receive them the moment it’s been captured. Because of this, security is easier to manage as well. It has a flash range up to 90′ ft and a trigger speed of 0.3 seconds, so it’s safe to say that it’ll be hard to miss anything. Also, the manufacturer will provide you with a preactivated sim for home service. A free app is also included. 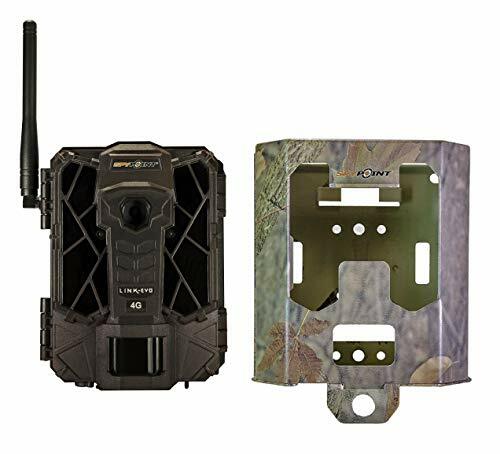 This is a great value cellular trail cam for anyone on a tight budget and even includes an entry-level free data plan but do know that a minimum 10-second delay might not be low enough to allow you to capture the entire animal. The camera uses 42 high-power LEDs for great image quality at night, and the infrared boost technology allows you to maximize the lighting when it counts. Also, it takes 12MP photos and 720p video, average quality for a trail cam. With 4g and the free app, you can access your photos and videos in any time through your smartphone- no longer needing to take the SD Card to see them. Although, this feature is still available as there is still an SD Card slot in the camera (35GB Max SD Card). Around 100 photos can be sent through your phone each day. The camera also features a time-lapse mode for long-term observation. Its video duration can last up to 90 seconds- videos will also be saved directly into the inserted SD Card. You can activate a premium “hunting plan” if you want and it will revert to the 100/mo for free photos the rest of the year. This makes it a little cheaper than competitors overall. Of course, jiggle the settings and stay off the free plan forever if that’s your thing. Take in mind that the pictures that you will see through the app would have a lower resolution than the images in the SD Card. Videos cannot be sent through the app. There is also a 10-second delay for every image, presumably because it will be sent to your phone. This trail camera has the standard eight battery slots, but for some reason, not all battery brands can be used to power it. Also, the product does not come with an SD Card. Battery life can last up to 3 months- the camera would not function if you don’t use lithium batteries. Also, take in mind to read the instructions thoroughly and carefully and follow the setup instructions- otherwise, you might end up having a hard time. Day pictures are said to have good quality except on shadowy areas as it tends to be a little too dark while night pictures have a limited amount of flash range. Placing the camera in a wide open field would not be beneficial as this camera doesn’t have the flash range to compensate for the lack of objects to bounce light off of. Also, the pictures sent to the app are highly compressed and not full resolution. The full resolution pictures are stored to the SD card. The camera is also incredibly picky with SD Cards. Some brands work, some don’t. You can set up a specific time the photos will be sent to your phone. Optimal – This is a compromise between the two modes above. The design of this camera is very compact; it has a built-in python bracket on the back and a 1/4″ x 20 threaded slot on the bottom for a Slate River Mount. This camera does not have an internal screen for programming; all programming will be done on the Spypoint app on your phone. Keep an eye on the signal bars, as pictures will have a harder time to send when it is less than three bars. There are times when you might end up getting a faulty cam, but you can message the company, and they will send you another one in time. This camera is excellent for security. Its motion sensor and 4G allows the user to get an immediate notification when something has alerted it in its premise. Although the pictures wouldn’t be 100% clear, it would be handy in a severe scenario. It has its faults, and buying batteries can get tricky on the go, it is recommended to pack up batteries in advance instead. It does a decent job of capturing motion (unfortunately, including foliage in the breeze), but some settings can minimize you having to deal with false detections. The camera cannot directly upload videos into the app. You have to get them off the SD card. If all you care about is slaying big deer and not worried about high-quality pix for social media posts, this can work for you. Don’t expect excellent quality (even the photos on the SD card are not that great), but if you want to figure out where the deer are so you can know which stand is hot and have some assurance the photos will reach you before you go hunting, this is a good choice. Overall, the camera does do all of its features well and isn’t that hard to use.